Based on the popular technique led by Vincent Mancarella in his live group sessions, these powerful tools are designed to help you connect to your True Self and hear your True Inner Voice. This technique uses common meditation methods with vivid, effective visualizations to help you go deep within to hear your True Inner Voice. Each Medization will help you relax and center yourself while exploring a specific topic. The downloadable mp3 starter pack serves as a a great foundation for just about anything you miight want to explore. Who Am I - Delve right in to discover who you Truly are. This deep exploration will help you see yourself and the world in a whole new, productive, stress-free way. Embodying Greatness - Align your intentions, actions, subconscious mind and more to accomplish your hopes, dreams and goals. You can use this Medization to clear away the worries, doubts and concerns and create what really makes your heart sing! Total Healing - This Medization is one of our favorites. Let this journey take you away to a place and an opportunity to heal your entire being, physical, emotional, mental, and spiritual. You will wipe all the "dis-ease" away and return feeling refreshed, healthy and energized! Inspiration & Guidance - Are you feeling stuck? Confused? Frustrated? Well this is exactly what the "spirit" doctor ordered. Use this Medization to glean insight and inspiration into anything you want to create for yourself in your life. Find the answers that perhaps have been eluding you for as long as you can remember. Daily Help - If you don't have time to do a full Medization then this CD will help you keep your focus, relaxation and center in a short period of time. You can use the morning medization, the afternoon reminder or the evening wrap up; quickly heal, destress or center. These short Medizations will surely be a valuable tool in your toolbox. Group Medization - This Medization serves as a great tool to help energetically connect and align any group together to create unity and stronger energy and intention for group healing or communication sessions or anything your group has come together to experience. 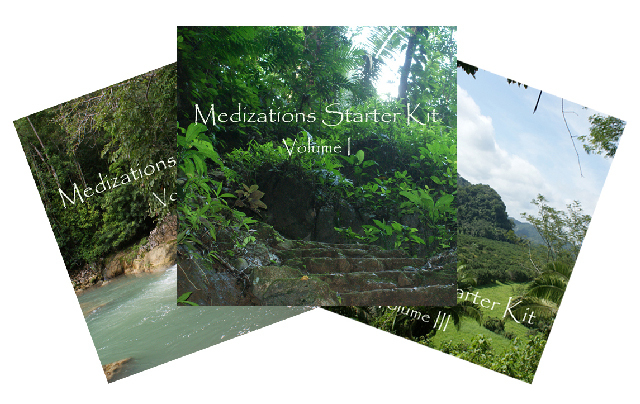 Our Medizations have become a popular and effective way to help you focus, energize, heal and create that which you wish to see in your life. - Thaddeus, music by Sanaya Roman. You can listen to samples of this and other Thaddeus music by visiting the Thaddeus Music Listening Room at http://www.orindaben.com/music/listenrm.php. Through Our Partners at Click2Sell.eu. 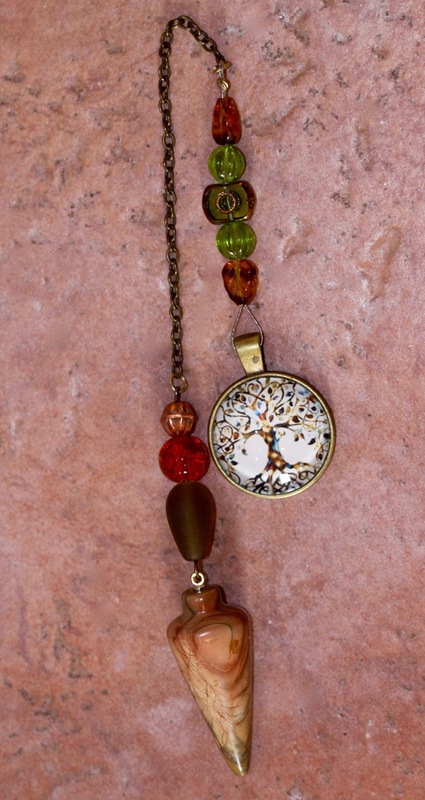 For years, Anna has been teaching and espousing the many uses and benefits of the pendulum. 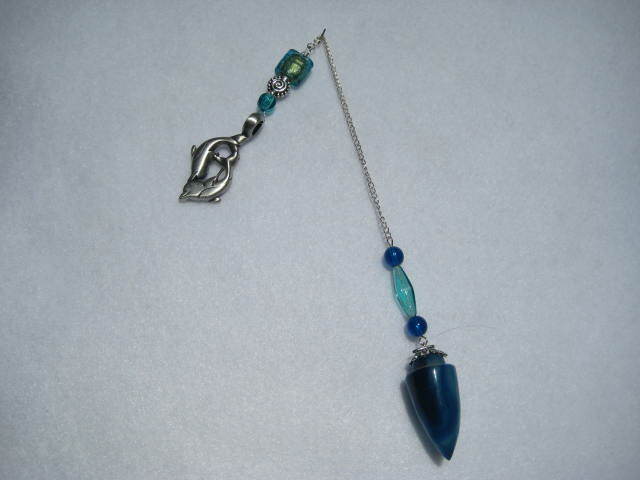 Pendulums are the perfect tool to divinate almost anything you can imagine. 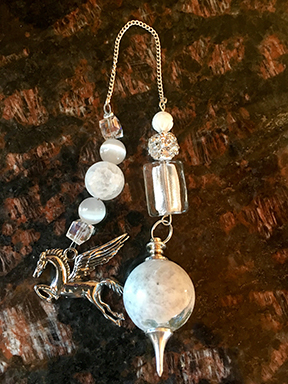 From connecting with intuitive guidance, to uncovering physical, emotional or spiritual needs, to finding lost animals, and more, the pendulum has an almost endless number of uses. 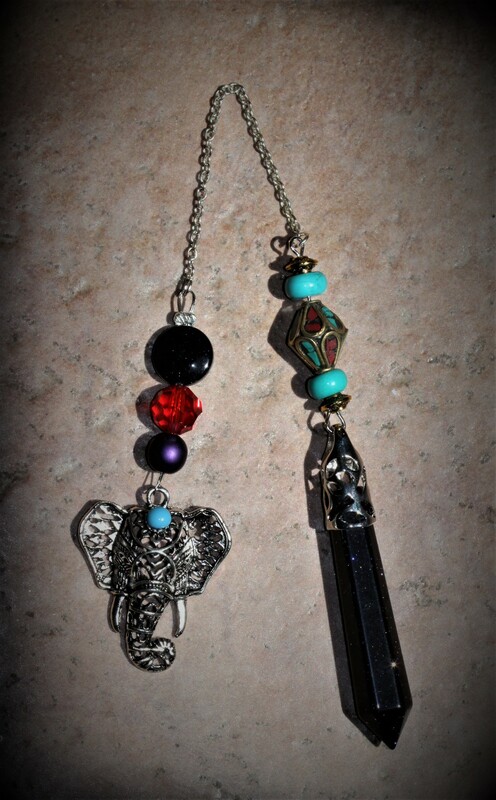 And now Reach Out to Horses is proud to present our own line of beautiful, animal totem pendulums. With 7 Animal Totem's available, use them as your main pendulum or use each pendulum when the energy of the animal is needed. 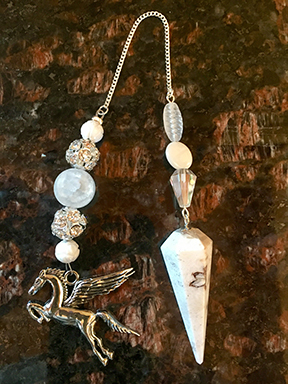 Whatever you decide, these one-of-a-kind pendulums are exactly what you need to start or deepen your journey into the world of divination. The power of the Bear lies in introspection. To reach our goals we must examine the path we have already traveled. Take the time to look within, rejuvenate your life, and follow your true path. 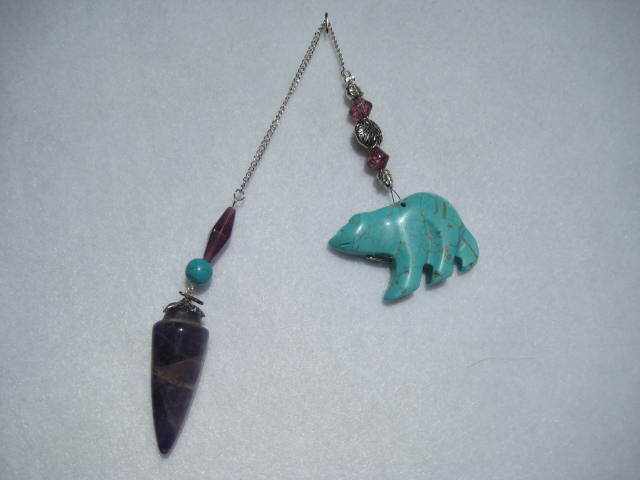 The turquoise of the bear helps promote honest and clear communication from the heart. The Amethyst drop stone is a very calming stone and promotes peace, contentment, and balance. It is excellent for meditation and can open the path for telepathy. Amethyst provides protection - just as mother bear protects her cubs. No animal is more loyal than the Dog. They teach us to serve others, to be tolerant, and to love unconditionally. The red, purple, and pink beads, as well as the tiny dog charm, are all symbols of that love. The rose quartz drop stone is the stone of unconditional love, forgiveness, compassion and kindness. It also raises one's self-esteem and sense of self-worth, and reminds you to be as true and loyal to yourself and others as your dog is to you. The Dolphin, intelligent and full of joy, represents the breath of life itself. Play with abandon. Laugh at yourself, and live life to the fullest. Blue and green beads represent Dolphin’s playground, moving from the light colors of the shallows to the deep dark blue of the ocean depths. The blue onyx drop stone prevents the draining of energy so you can maintain the breath of life. Blue Onyx is also associated with the throat chakra and enhances communication. 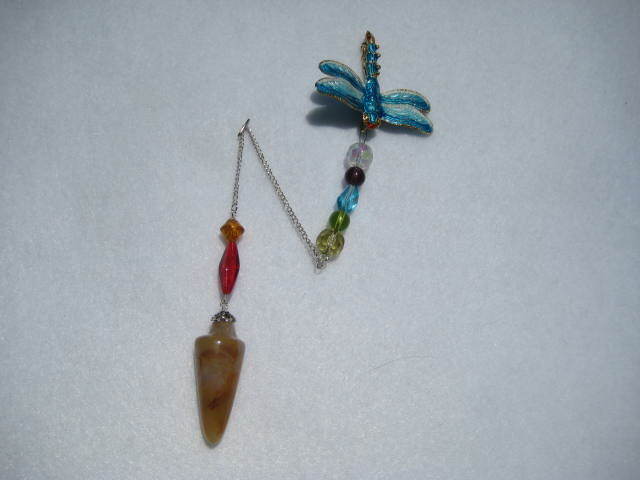 Dragonfly represents dreamtime. 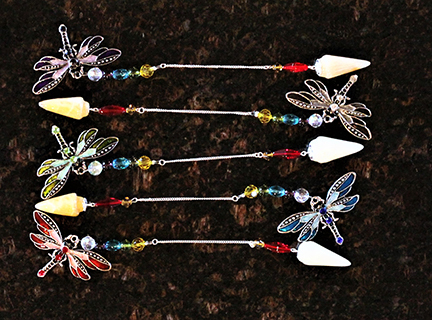 The ethereal, iridescent colors of their wings seem almost as if they could only exist in a dream. 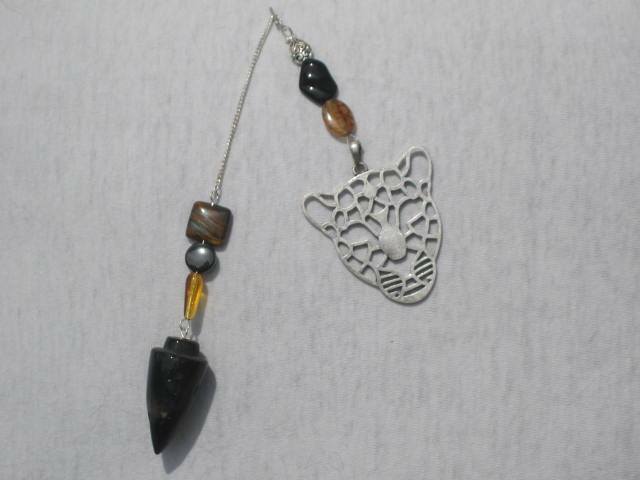 The beads on this piece represent the seven chakra colors. The golden quartz drop stone is excellent for balancing all of your chakras. Quartz also provides clarity of thinking and communication, which aids in meditation. This piece reminds you to never give up and embrace the changes you bring about in your life as you follow your dreams. Comes in your choice of 6 colors: Original (seen above), Purple, Black, Green, Blue, Red (seen below). You can make your selection in the Shopping Cart. Take heart, gather your courage and soar to great heights. Look at the big picture and yet still see the small details that make life so interesting. From the purple mountains above, In which the eagle soars, to the green fields he watches over, this piece represents the majesty and great spirit of the Eagle. 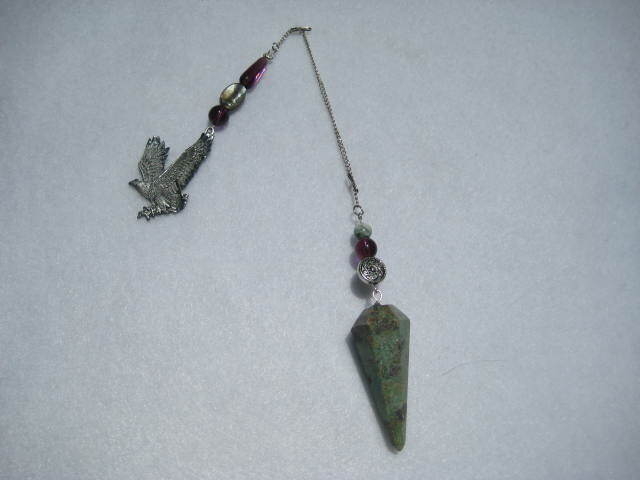 The drop stone, Ruby Zoisite, enhances trust in the goodness of life and the universe and the connection between the two - just as Eagle connects man to the Divine. Horse represents physical strength and wisdom. The Horse has much to give – love, compassion & the knowledge that the strength of the herd can be powerful medicine. The soft green & warm amber beads represent the freedom to explore the beautiful plains of the wild horse and the infinite possibilities in your own life. The bloodstone drop stone has many grounding and calming properties, is the stone of courage and adaptability, and great for releasing blockages. Wolf is the pathfinder, the teacher. Wolf teaches us a strong love of family and loyalty, To always keep looking for new ideas and never give up on our individual dreams. At the same time wolf reminds us to have fun, play and, occasionally, howl at the moon. The Turquoise and amber beads provide calming and grounding. The moonstone drop stone has great calming properties and enhances psychic ability. It is also the stone of love - just as the Wolf's love of family. life, pace yourself and save some energy for the finish line. 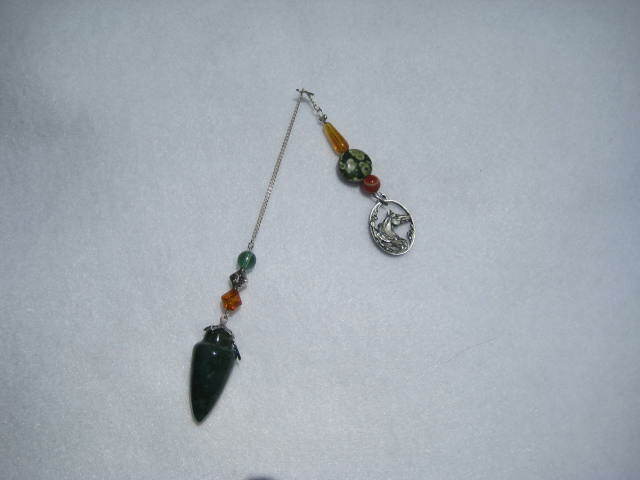 This pendulum has a Unakite drop stone which has a gentle but powerful energy and can help you find your animal guide. It is a good protection stone and can bring unconditional love. 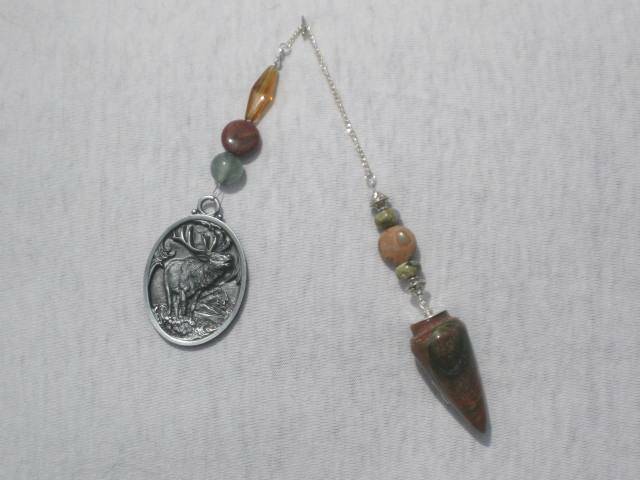 Red creek Jasper and Safari Jasper beads are the stones for nurturing, peace and relaxation. 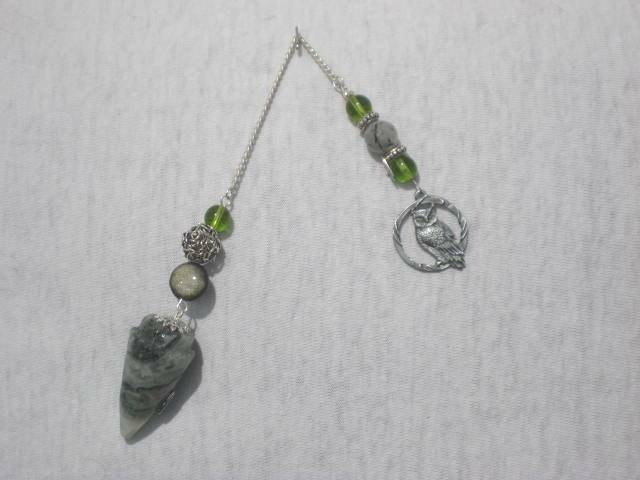 The soft green Prehnite bead offers protection and is the stone of prophesy. And rhyolite beads teach us to recognize our own potential. Pegasus represents the strength and grounded power of the horse, while at the same time symbolizes the freedom of flight, and the ability to soar while aspiring to the highest levels of accomplishment. Pegasus gives us the ability to harness the magic in life. The white stones and beads represent the purity of unconditional love. You can make your selection in the Shopping Cart. Scolecite: The drop stone is Scolecite which is one of the highest vibrational crystals. This strong stone aids communication, especially with spirit and awakens the heart and facilitates deep inner peace and spiritual transformation. Scolecite can also assist with understanding the root of a problem or issue or challenge so that it can be worked with and overcome successfully. Rainbow Moonstone Pegasus: The drop stone in Rainbow Moonstone. Rainbow moonstone is a very calming stone and can strengthen your intuitive powers. It enhances your compassion and confidence, restores hope and balance in your life. Owl is a symbol of wisdom and allows you to recognize deception, an observer of all that goes on around you. 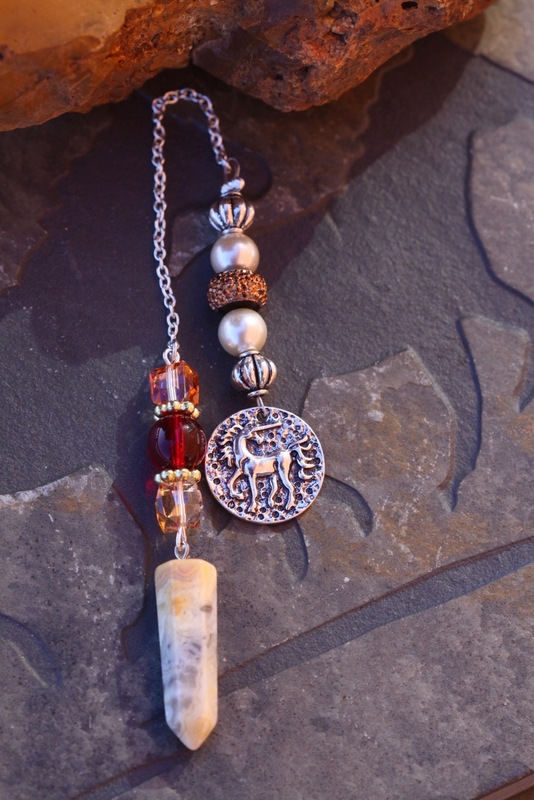 The drop stone is Tree Agate which aids in with introspection and self-discovery while at the same time providing a wider viewpoint of the world. The Rainbow Obsidian represents the shimmery moon and is a very grounding stone while letting the light in to your life. This piece is the night owl silently flying through the forest trees by the light of the moon to hunt before returning to the nest. 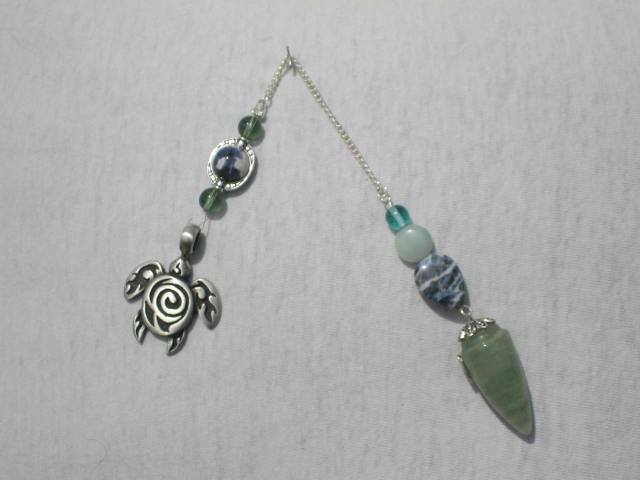 The Turtle is a symbol of Mother Earth represented by the sodalite bead revolving around the silver bead. Turtle reminds us to give back and protect the Earth. Turtle is an excellent teacher in the art of grounding oneself. Turtle’s shell represents the protection the Earth has employed for centuries as man abused the planet and offers you protection from hurt as well. Turtle employs both water and earth energies to offer a harmonious setting wherever you may be. 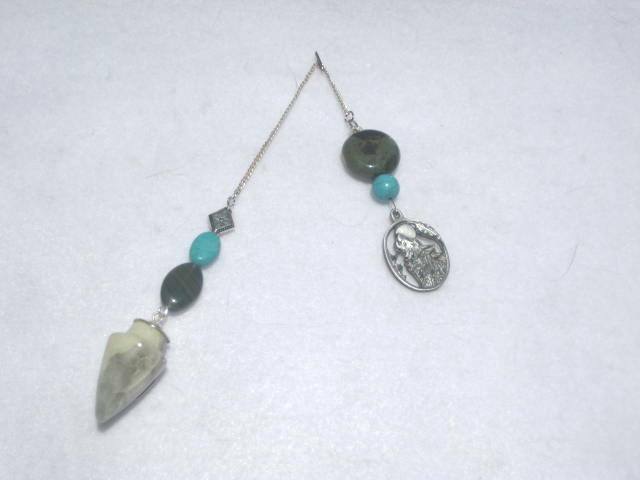 The drop stone is Aventurine which represents prosperity, calmness and protection. The beads are Sodalite (truth and communication) and Amazonite (communication). Whale is the keeper of the history of the Earth. Whale helps us balance our physical and emotional self. Their songs remind us of the history all beings have shared throughout time so that we may better connect with all creatures on Earth. 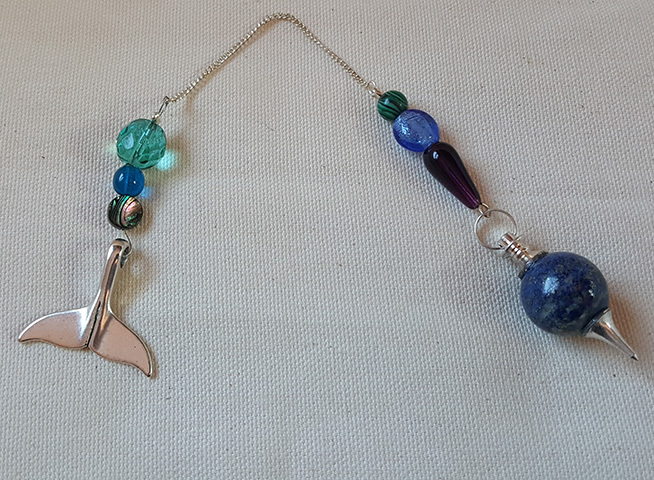 This pendulum has the aqua, deep blues, greens and purples of the ocean. The malachite bead represents balance and the Lapis Lazuli drop stone which represents truth and inner power and creates a strong connection between the physical and celestial planes. Believe in you, believe in your knowledge, and believe in making your dreams come true. The drop stone is Crazy agate in the shape of the Unicorn's horn. This stone vibrates at a lower frequency allowing you to be more grounded and to stay present. This stone has a calming effect and will give you confidence. The beads represent the frequent use in Heraldry of the Unicorn with rich jewel tones of gold, silver, and ruby red. the connection to the royal position of the elephant in many cultures. The legend of the Phoenix is timeless. The ability to rise from the ashes and soar is universal. The Phoenix represents the ability to transform and our continual rebirth as we transition through life, renewing ourselves through each challenge and rising from the ashes. 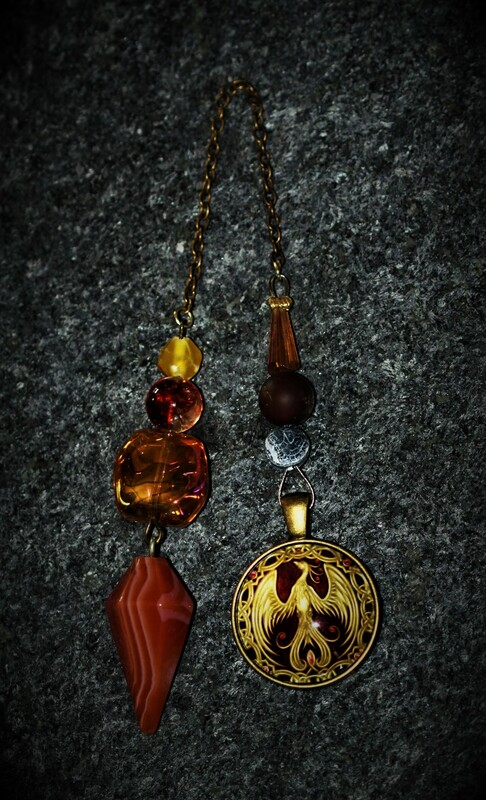 The beads on this pendulum show our transformation from the ashes to the first flicker of flame, from the coals to the final flames and combustion, only to start the journey once again. 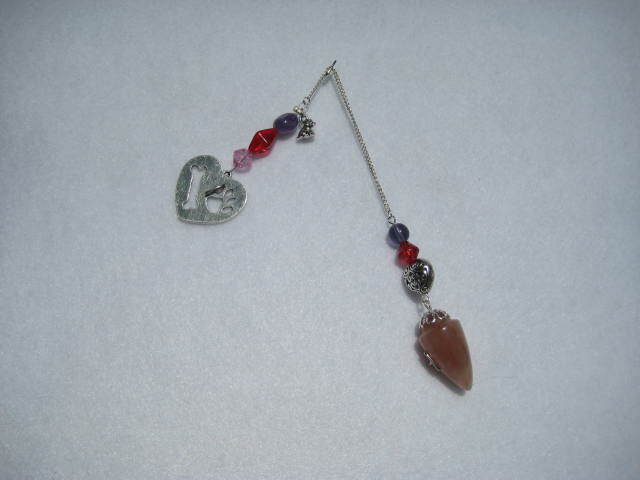 The drop stone is Red Agate/Carnelian, which is a very grounding stone and useful for people who lead chaotic lives. It will keep you stabilized while allowing you to continue to function at a high energy level. Whispers from a Horse's Heart. Inspired by Melisa's daily Whispers from a Horses Heart you will be delighted reading the in-depth, prophetic messages from the rest of the herd. What is so different about these card decks, other than their beautiful artwork? The inspiration and guidance that is offered on the cards will encourage you to reflect upon your dreams, desires, and challenges. Every day, just pick a card that appeals to you in that moment and read its message.You will be amazed with just how appropriate the message is to what you are feeling or dealing with. They often provide you with comfort as well as reaffirm your actions and decisions. Should you prefer to not place your order on-line please contact: info@reachouttohorses.com for an order form or call Anna Twinney on (303) 642-7341. DISTRUBUTORS: Are you interested in becoming a Reach Out to Horses DVD Distributor? We are looking for dedicated people wishing to get involved in spreading the word. Contact Anna for further details. 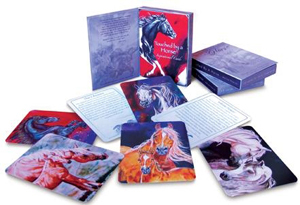 WHOLESALERS: Please contact sales@reachouttohorses.com for more information on how to retail the DVDs.